The first time I visited Berlin was in the spring of 1989. Falling into conversation with a Berliner on a bus one day I asked him if he thought the Wall would ever be taken down. Of course it would, he replied, though not in the lifetime of any of us. But by November of that year, as we all now know, the Berlin Wall was breached and the process of removing it had begun. Perhaps we should have been prepared for Berlin to surprise us. Stuart Braun seems to agree, and City of Exiles (Noctua Press) is his explanation why. The author is an Australian writer and journalist who first visited Berlin in 1996. He initially spent only a week there, but the city had a profound effect on him and remained in his peripheral thoughts throughout the next few years, a period of time when he lived and worked in Melbourne and Tokyo. Braun returned to Berlin in 2009 with no firm plans and no specific time-scale for how long he would stay. But like many before him, he fell under the spell of the city and has remained there to this day. Some of those who come to Berlin, Braun candidly confesses, are ‘privileged soul-searchers like me’, while others are escaping wars in the Middle East, austerity in Southern Europe and all manner of traumas and anxieties elsewhere. Berlin is, in fact, home to the largest Palestinian community outside the Middle East. Over the years Berlin has embraced exiles from East Germany and draft-dodgers from West Germany. Above all else the city has attracted artists, musicians, free-thinkers and rebels from all over the world. They thrive in a milieu of generous subsidies for the creative arts, readily available alongside cheap housing and the city’s free-wheeling spirit. Braun tells us how all of those who come to Berlin, whatever their reason, are quickly intoxicated by the city’s fabled air, its Luft. The Luft is ‘blown in from the vast glacial plains beyond…(and is)… the mythic source of its etheric allure’. All too often, he argues, visitors stay longer than they intended and end up becoming exiles; they find themselves unexpectedly transformed into Wahlberliner, that large community of Berliners who were born elsewhere. This is not a new phenomenon; his extensive historical research offers evidence that Wahlberliner have formed a significant slice of the city’s population ever since Berlin was founded. Berlin is quite unlike other major cities, argues Braun; not just as a result of its history and the shadow of Nazism, Communism and the Wall, but because of the way it is structured. The city is a series of villages and much of the life of its inhabitants revolves around the Kiez, the neighbourhood. Central to the idea of the Kiez, in the older parts of Berlin at least, are the city’s tenements. These five-storey blocks were first built in the 1870s and were quickly became known to Berliners as the Mietskasernen (rental barracks) because they looked so much like accommodation for soldiers. But the tenements were a visionary attempt at social cohesion, with the wealthier professionals housed in the large front apartments and the unskilled workers at the back. The front of each tenement faced the back of the next one, so that both sets of homes and social classes would look out onto each other and share the same inner courtyard garden. These courtyards, Hinterhöfe or simply Hof, are a key feature of Berlin’s apartment blocks and are quite different to anything one would find in New York or Paris. They encourage a communal feel based around shared outdoor space. Braun suggests that this ‘perhaps underpins the egalitarian feeling on Berlin’s streets today.’ The Hof provides somewhere to sit, talk with friends, share food and drink beer. In many places it also provides a place to work, trade goods and perform music or theatre. City of Exiles combines personal memoir, historical overview and a snap-shot of present day Berlin. The evidence of Braun’s long hours of research in the Berlin State Library is clear throughout this book; historical analysis is rigorous and his conclusions are presented with clarity. In a sense, there is nothing new in his history of the city; many have covered the same ground before him. But where Braun cuts free and tells a whole new story is in his constant drip-feed of tales about the artists and rebels, past and present, who have made Berlin their home. Braun is obliged to mention the obvious names, such as Christopher Isherwood and Nick Cave; indeed, I also lost count of the number of times we were reminded how David Bowie and Iggy Pop both spent time in Berlin in the 1970s recharging their creative batteries. But it is the less well-known figures, those with ample creative energy but very little money, who illustrate why Berlin exerts such a magnetic pull for free-thinkers from all over the world. In the 1920s and 1930s African-American jazz musicians found a freedom in Berlin that they could not enjoy at home, particularly in the American South. The same was true for the multi-talented performer Josephine Baker and transgressive film star Louise Brooks. The period also saw Berlin attracting a host of artists from the Dadaist movement. More recently, Berlin has served as home for American transgender punk musician Jayne County, Vaginal Davis, the ‘terrorist drag’ performance artist who relocated from LA, French experimental musician Françoise Cactus, American photographer Nan Goldin and the American artist and film-maker Danielle de Picciotto. Picciotto also has the distinction of being one of the founders of Berlin’s Love Parade. Berlin never stands still. Braun notes that the tower cranes have been moving in over the past decade and many of the people he speaks to fear that Berlin will finally fall to the bankers and become ‘like London’. But Berlin continues to resist the commodification, authoritarian control and surveillance-culture that have engulfed New York, London and Paris. Having been shackled by Fascism and Communism for so many years, Berliners are naturally suspicious of authority and its petty rules and restrictions; for example, they habitually ignore any Federal restrictions on smoking in bars and drinking alcohol in the street. Braun enjoys Berlin’s ‘liberating lawlessness’ and the feeling of ‘being treated as an adult’. Contrary to the arguments of the ‘zero tolerance’ zealots of other major cities, this liberal attitude actually seems to make Berlin somewhere that is mostly ‘safe to walk at night’, a city that is not ‘charged with paranoia and fear’. The trouble is that, for me anyway, Braun tries to tell us too much in his introduction; he mentions too many of the people he has met in Berlin rather than focusing in on just a few of them. The result is a plethora of frustratingly brief anecdotes and too many references to something someone once said in a bar or at a party. 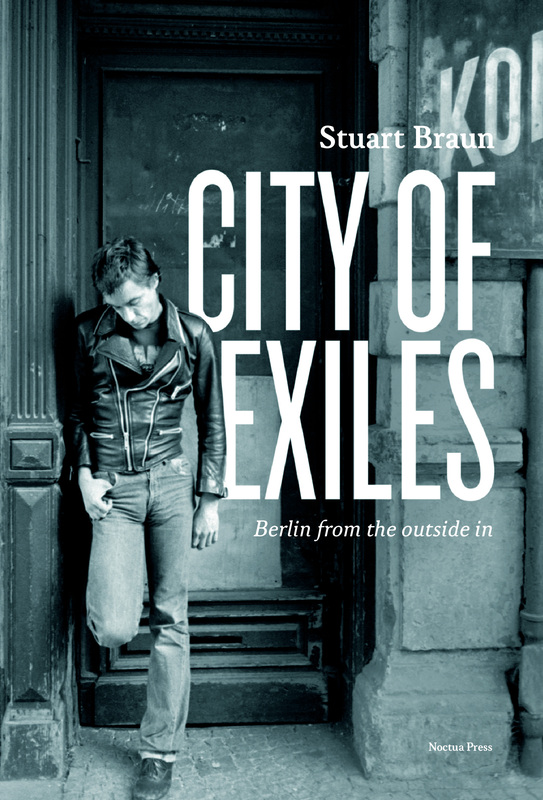 Posted in Book reviews and tagged berlin, exiles, stuart braun. Bookmark the permalink.